Hey guys! It’s been awhile since I wrote up a blog, hopefully all is going well with your training and nutrition goals! I’ve been slammed with all sorts of things the last two weeks, a lot of which included moving to a new house! But now that that’s all said and done, I can finally get back to my normal routine. One thing that I can always count on during the times that life just overwhelms everything, is the gym. It’s always there waiting patiently for me to return and dominate. I’m guessing that you’re the same way when it comes to not missing gym sessions. It becomes an addiction that is very hard to break. And who would want to break it anyway?! Over the last few weeks, I found myself having a harder and harder time during my workouts. I craved being at the gym and the feeling it gives me, but for some reason I couldn’t breathe correctly, even at the lowest intensity. It’s like I was trying desperately to get a full breath of air, but I just couldn’t. Long story short, this continued for a couple weeks until I finally found the source to my problem. With the elevated heart rate that I had during this time and lack of sleep that I was getting, the culprit to my madness was a little thing called caffeine. Not only did my body start shutting down vital components to breathing, it was completely DONE with receiving caffeine. And now you’re probably thinking, what does any of this have to do with curling 135lbs?? Glad you asked. You see, after this crazy ordeal of tortured breathing for two weeks, I sought out a change to my supplementation. This wasn’t just one or two supplements that I’d be changing either. It was a complete OVERHAUL of my kitchen cabinets filled with all sorts of brands, stimulants and proteins that I had been using for years. It was time to make something that is usually complicated, and turn it into something simple. All of my supplements would come from the same place, would be completely backed by scientific research, and would produce results that were far better than anything I had seen before. I’d like to introduce you to a company called Advocare. I researched this company thoroughly and to my surprise, the satisfaction by the customers who used the products was astounding. Not only were people shedding fat like crazy from these supplements, they were gaining incredible amounts of strength and mass ALL while feeling better at the same time. I was sold. I had to try it for myself. I decided to make myself a guinea pig for this experiment and for 3 solid weeks, I would track my results through my normal lifting and nutritional routine. Nothing would change beside my supplements. Most of the time, Friday is arm day. And for most of the time, I’m exhausted from a full week of lifting when this day comes. Ya, not on this week. I felt so rejuvenated and so recovered during arms that I thought that something must be wrong. Turns out that it wasn’t. On the first exercise of my bicep workout AFTER triceps, I got up to my last two working sets of barbell curls. I was able to successfully curl 135 pounds for 3 reps a piece. The actual weight wasn’t the exciting part to me. The exciting part was that it was 20 POUNDS more than I had ever done! A huge jump in weight that is unheard of in my training. 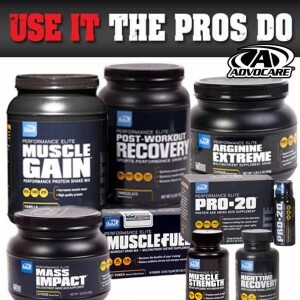 This will take you directly to the Performance Elite line of products. I recommend Arginine Extreme, Mass Impact, Muscle Strength and Spark! During this 3 week phase I am also recording a video blog to capture all of my progress as it unfolds. So you can see for yourself the results that I get and the exact supplements that I use. Hope that you’re able to get the results that you want as well! These products aren’t the same as the stuff you’ll find in GNC or Hi-Health. They dominate all of those. The quality is real and the results are real. If you have any questions just feel free to ask. I’m always here to help you. Take care and get strong and shredded! Built from a foundation of faith and perseverance, Mitch Muller is the owner and founder of Mindset Fitness, with a dream of helping others pursue excellence in both the gym and in life. Read more about his journey here. The Mindset Fitness Philosophy and Mission Statement: To provide Biblically-based health and fitness lifestyle education, empowerment and motivation, which gives HOPE to everyone, from the physically fit to the physically distressed. It is our vision to positively impact the health and fitness lifestyle of one million people through motivation by the year 2025.